For the 24 hours to 23:00 GMT, the USD rose 0.15% against the CAD and closed at 1.3350 on Friday. Macroeconomic data showed that Canada’s manufacturing shipments rebounded 1.0% in January, higher than market anticipations for a rise of 0.4%. Manufacturing shipments had recorded a revised decline of 1.1% in the prior month. Meanwhile, the nation’s existing home sales plunged 9.1% on a monthly basis in February, surpassing market expectations for a fall of 4.0%. In the prior month, existing home sales had recorded a rise of 3.6%. In the Asian session, at GMT0400, the pair is trading at 1.3319, with the USD trading 0.23% lower against the CAD from Friday’s close. 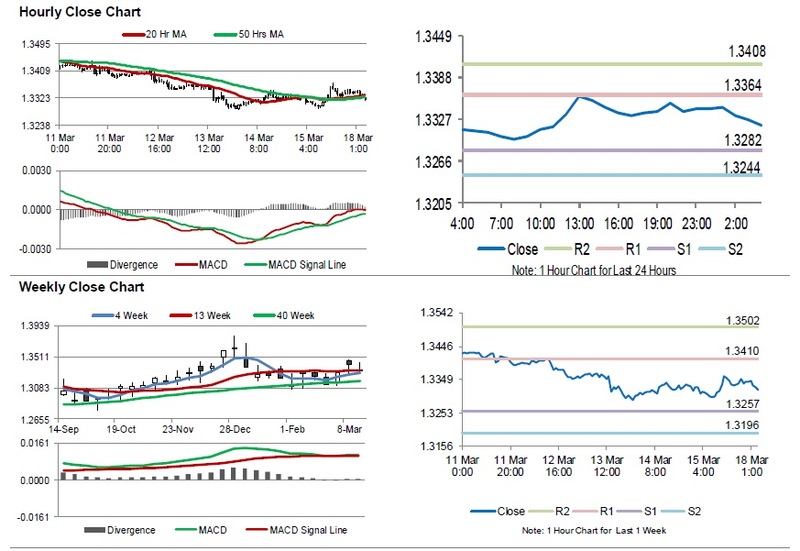 The pair is expected to find support at 1.3282, and a fall through could take it to the next support level of 1.3244. The pair is expected to find its first resistance at 1.3364, and a rise through could take it to the next resistance level of 1.3408. Amid lack of economic releases in Canada today, traders would focus on global macroeconomic events for further direction.